I had a reminder today of why it is always so important to go over the mechanicals on your bike frequently. As my buddy and I rolled out of the parking lot I eased on my front brake and I heard an awful metal to metal grinding noise… dang. So let’s back up to a couple days before. I was cleaning my bike and I did a nice inspection to make sure everything was as it should be. I pulled my front wheel to check the brake pads and sure enough, they were nearly toast! I didn’t have any spares in the toolbox so I bought some at my local shop (Squatch Bikes & Brews). And then I screwed up. I left my brand new pads sitting in my Jeep’s cup holder and proceeded to go on a few more rides without thinking about my brakes. That is until they gave me that nice reminder… metal on metal sounds awful by the way. I tell you this embarrassing story to hopefully keep you from putting yourself in the same situation. So here is a step by step on what to check on your bike prior to going for a ride! This is not what you want your brake pads to look like. Step 1: Start with a clean bike. You do not have to totally clean your bike between rides, but there are a few things that always warrant attention. Start with your front suspension. Wipe the stanchions on your fork being sure to get any grit that is around the seals. Next wipe down your rear suspension, mainly the seal on your rear shock, and any grit that is around the pivots. I typically will use a rag like a piece of floss and thread it around the pivot to get any grit on the backside of the seals. Take note of any excess suspension oil around the seals as this typically indicates that it is time for a service. This will help keep your suspension running happily for a long time. Also make sure to wipe down your dropper post, again especially around the seal. Step 2: Spin your wheels and look for any wobbles. Some tires will have a slight wobble to them out of the box and that is ok, but watch the rim to make sure it is not moving side to side or up and down excessively. Also look at your brake rotors to make sure they are straight and not rubbing on your caliper. Check your quick releases or thru-axles and ensure they are snug. Lastly it is not a bad idea to feel your spokes to make sure there are not any that have worked loose. Loose spokes can quickly lead to a trashed wheel! Step 3: Check your brake pads. This is one that is easy to forget, but it really is crucial for safety. Take a flashlight (or cell phone) and shine it into the top of the caliper to see how much pad material is left. Pull your wheel and you should be able to see into the caliper easier if you can’t tell with a light alone. Or you can always just pull your pads out of the caliper. Shimano says to replace pads once they’re down to 1 mm of pad material left. It is a good idea to have a set of spare pads in the event that you forget and your pads wear out completely on a ride. I like to keep my old pads (if they’re not totally shot) as spares that I can use on the trail. This caliper could use an adjustment. But the pads have plenty of life left. Step 4: Clean and lubricate your chain. There is nothing more annoying than a noisy chain. 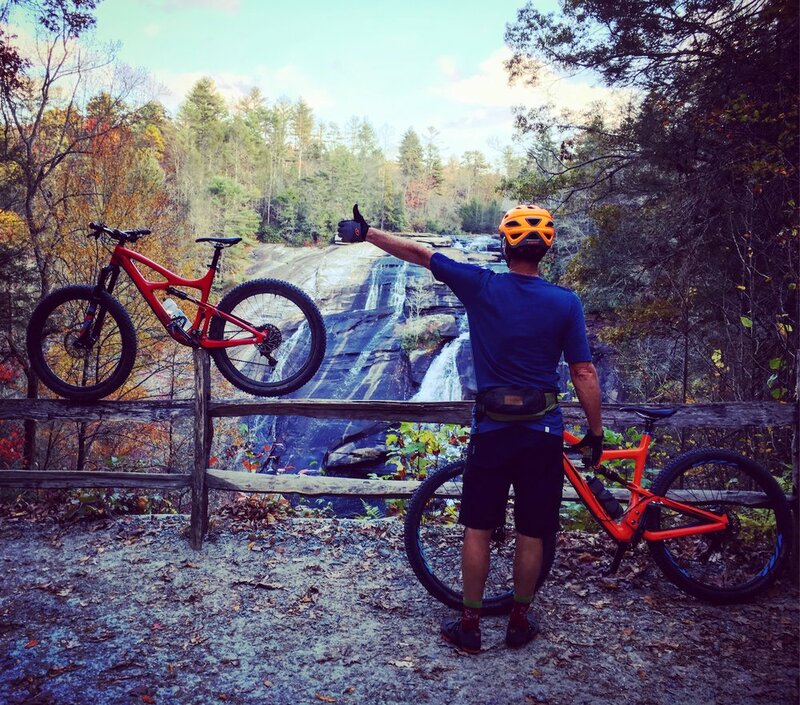 Where you live will determine how long you can go without lubing, but here in Western North Carolina it is pretty much every ride. Also make sure your cassette is clear of debris such as sticks, leaves, and excess dirt. Cleaning your chain (and cassette, chainrings, and pulley wheels) will help to make your drivetrain last much longer. With 11 and 12 speed cassettes costing the big $$ now, it is definitely in your best interest to help those components to last as long as possible. Every few weeks, check your chain stretch with a chain checker, or stop by your local shop for assistance if you do not own a chain checker. That way you do not overstretch your chain and ruin your cassette. Step 5: Check your gears & dropper post. Make sure that everything is shifting properly on your bike. Visually look at your rear derailleur to make sure it is not bent at all, especially if you crash or your bike falls over. A bent derailleur into the spokes is a quick way to cause a lot of damage ($$$). Also, actuate your dropper post to make sure it is working properly. Inspect all cables for any fraying. A snapped dropper or shifter cable is no fun (again, ask me how I know...). Step 6: Check your tires. Do a visual inspection to check for any excess wear. Look at both the tread and the sidewalls. Sometimes you can get a puncture and not know it because the sealant has done its job. (If you’re running tubeless. And if you’re not running tubeless, I highly recommend this as your next upgrade). You also need to occasionally check your sealant to make sure it has not dried up too much. I typically just add an ounce or so after a few months through the valve stem. This is an important safety item because flat tires at best are an inconvenience and at worst can cause a crash. Step 7: Check your headset. It is really important to make sure your headset is tight. The easiest way to check is to turn your bars 90 degrees, grab your front brake, place your other hand under the stem on your headset, and rock the front of the bike forwards and backwards. If it is loose you should feel it. Repeat with your hand on the lower part of the headset where your fork goes into your frame. If it feels loose, stop by and let your local shop check it out for you. Step 8: Check your air pressures, tires, and suspension. Some people use gauges, some go by feel. Do whatever works best for you. I often will check my tires by squeezing them with my hand, and then I hop on the bike to check the suspension by feel. If you do check your suspension with a pump, you will lose a little bit of pressure just by checking, so give it a little pump even if it is spot on to make up for what you let out checking it. Step 9: Go ride! Do a little lap around the parking lot and make sure everything feels right. If something seems off, take the time to check it! Check before you are ten miles in to a ride and something goes wrong! I’ve learned the hard way over the years. You can’t prevent everything, but paying attention to your bike can help prevent a lot. And I know this seems like a lot, but once you get use to checking stuff it becomes second nature and doesn't take long at all. October has been fantastic here in Brevard, NC. The leaves have been amazing, the temperatures have been mild, and rain has been scarce (a little too scarce actually). Despite the drought, it has definitely been ideal mountain biking conditions! We have been fortunate enough to get a lot of time in on the trails this past month and here are a few pictures to help inspire you to plan a trip for next fall! Riding bikes with friends is the best! Trent & Katie out in Dupont! Just enjoying some of the slickrock in Dupont! Katie & Trent cruising down Ridgeline! High Falls in Dupont, it's beautiful even in a drought. Ok so technically this picture is from November 1st... but it's just so good! We've had a great month and a fantastic start to fall in the mountains of Western North Carolina. The best thing is that the riding is good year round! Come up for a visit and let us show you around! 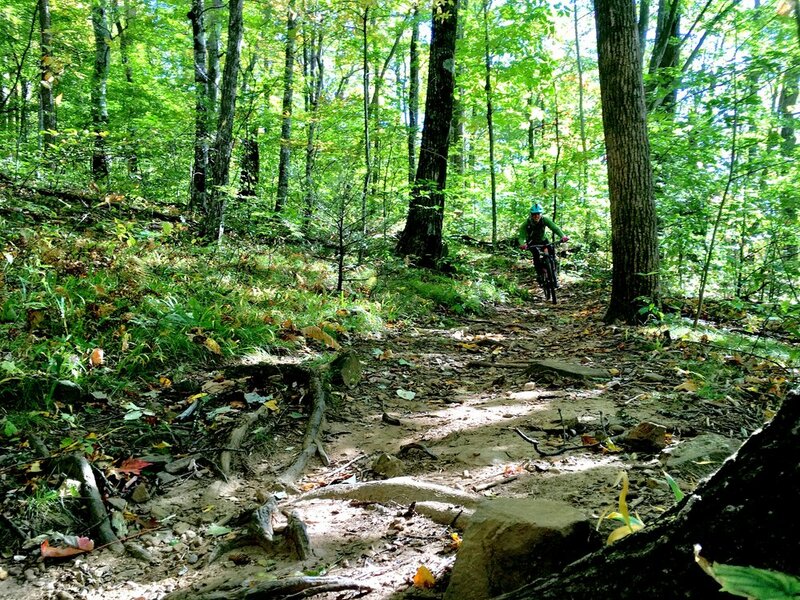 Fall has arrived in Pisgah, and the mountain biking is awesome! Just one of the many beautiful waterfalls in Pisgah! The leaves are changing and the riding is perfect! 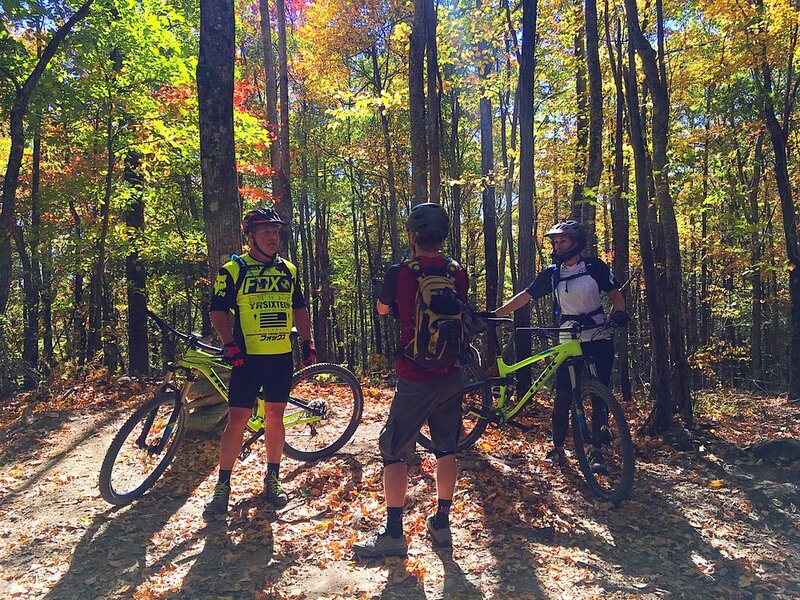 The fall is one of the best times to experience the trails in Pisgah and Dupont. The temperature is perfect for riding, the weather is typically dry, and the leaves are beautiful! 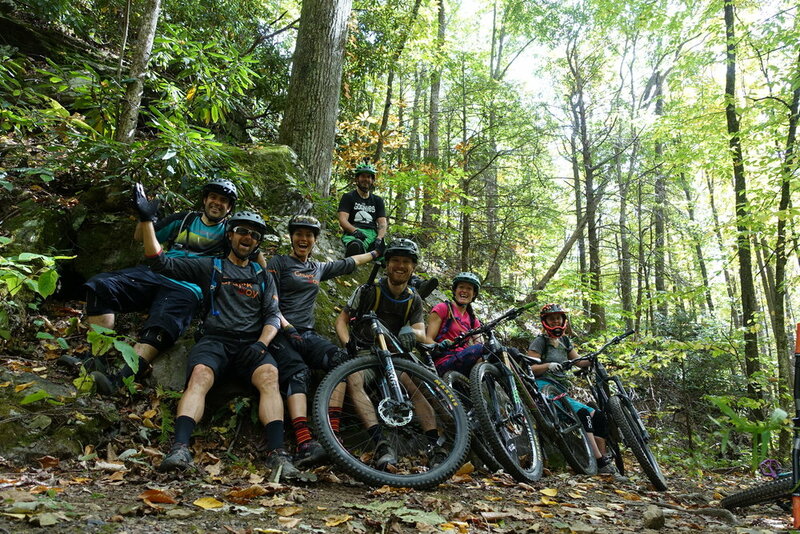 There are a number of seasonal trails in Pisgah that opened up to mountain bikes on October 15, so the fall is the perfect time to experience everything Pisgah has to offer! It is also a fantastic time to head up to the Blue Ridge Parkway to get some great long range views. Give us a call and let our guides help you make the most of your time in Brevard! Who doesn't love riding bikes?? Oh man, sometimes you forget how refreshing it can be to get away. Jenna and I were fortunate enough to recently spend a week in Moab. It's been over 2 years since we'd been able to ride out there, and I already cannot wait to go back! Here is a quick recap of the trip. Our friends at Crankjoy invited us out for a week of riding bikes, campfires, and great company. 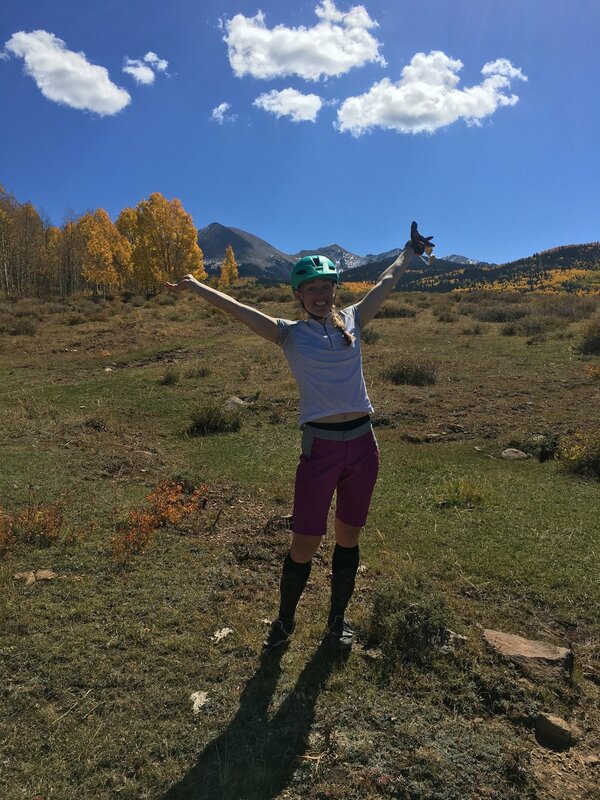 We spent three days riding high up in the La Sal Mountains above Moab (9,000-11,000 feet to be exact! ), riding with Ibis Cycles and their first ever Ibis Migration. We had awesome local guides show us phenomenal trails, cook meals, and shuttle us to the best trailheads. 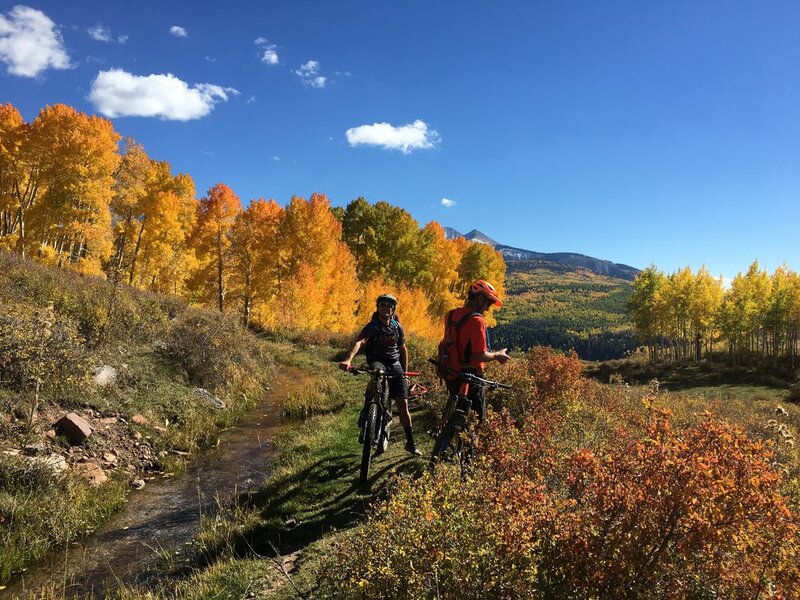 Ibis provided a full fleet of bikes for us to ride, and mother nature even cooperated perfectly offering beautiful fall colors and cool dry weather. In short, it was a trip of a lifetime. We finished up the final day by ripping down the Whole Enchilada culminating with the classic descent down Porcupine Rim into town. I cannot thank Scot and the rest of the crew enough for putting on such a great event! Seriously, this is tough to beat! So after the Ibis Migration, we moved our camp to just outside of Moab and prepared for Outerbike. Outerbike is one of the largest mountain bike demo festivals out there. 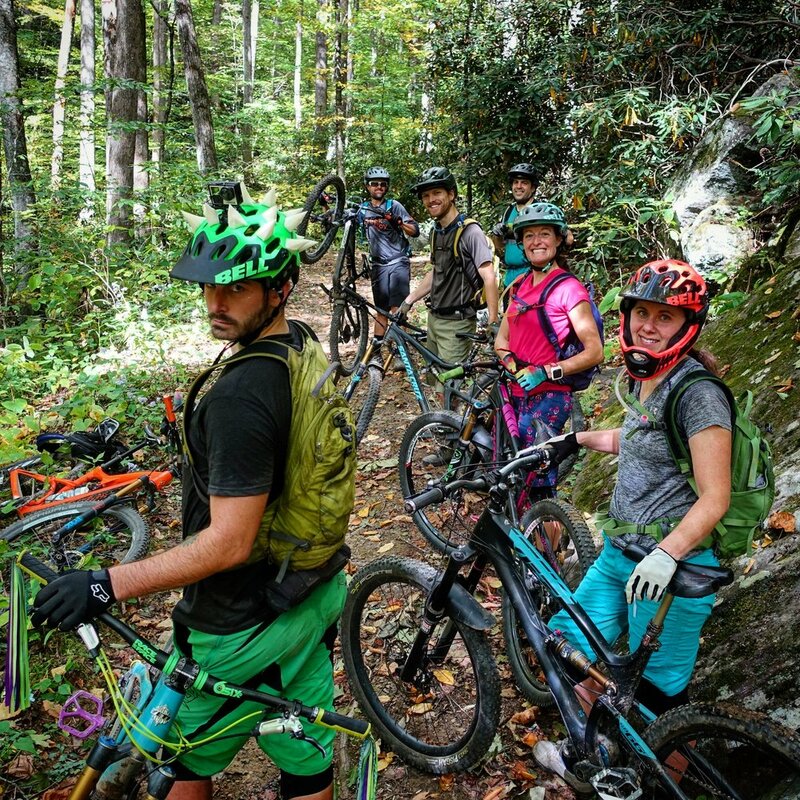 Most of the top mountain bike brands, along with several smaller brands, bring their demo fleets to one place, providing you with your pick at riding whatever bike you want! You can either shred the trails right there at the event or grab a shuttle to the chosen Moab trail of the day: Navajo Rocks, Mag 7, and Amasa Back Trails this year! It honestly was just as fun as it sounds. We got to ride some of the coolest new bikes available for three days straight on some of the best trails out there. What more could you ask for?! There are also shoes, hydration packs, nutrition, trail advocacy groups, and all other kinds of vendors there. Oh, and I cannot forget to mention the incredible food provided at lunch to refuel you each day for round 2! And a little Outerbike tradition you might want to know about if you decide to attend: Each morning starts with a mad dash with everyone running to get the bike they want! Here is a video of the day 2 morning rush... Jenna nearly goes down, but saves it by grabbing on to some guy, totally nuts! Outerbike puts on a great event and I totally recommend attending, especially if you're searching for the perfect new bike. So after about 4,000 miles of driving, 9 nights of sleeping on the ground, one broken helmet, countless new memories, some awesome new friends, sore muscles, and smiles that just won't quit, we are happy to be home in North Carolina, but dreaming of next time.